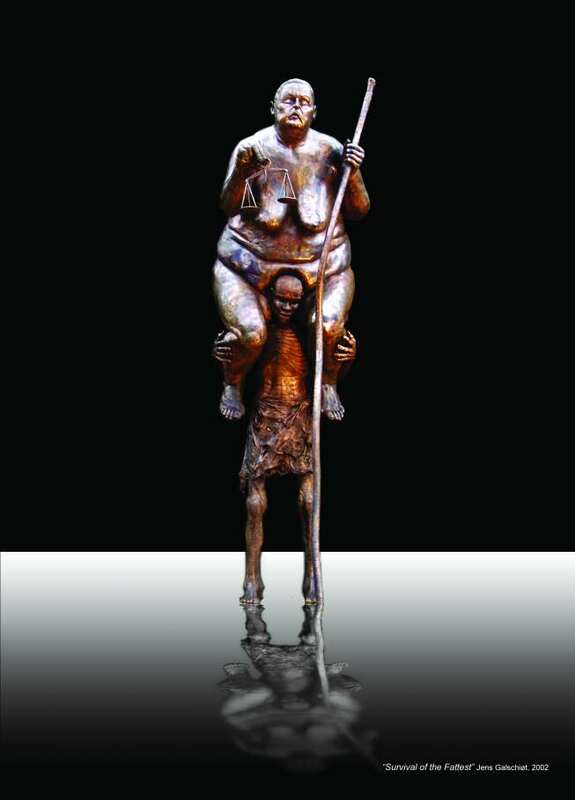 A huge, fat woman from the West sits on the shoulders of a starved African man. The 3.5 metre high sculpture was created by Jens Galschiøt in collaboration with his colleague Lars Calmar. The sculpture epitomizes the imbalanced distribution of the world’s resources. We are living comfortably, oppressing the poor by means of a biased and unjust system of global trade. The richest countries enforce discriminatory trade policies and subsidies to keep the poorest countries out of competition. The sculpture was unveiled in December of 2002 in Copenhagen. Subsequently Danish NGOs used the sculpture in their campaign against the hegemony which is the global trade racket.